The Tip Pee Toe™ Toddler Step Stool is a folding, portable child step stool designed for travel and potty training. The step stool's compact design makes it easy take in your purse or diaper bag so your kids are able reach the potty and sink while traveling or at home. A child stepping stool that even stores in the vanity for easy access when not in use. 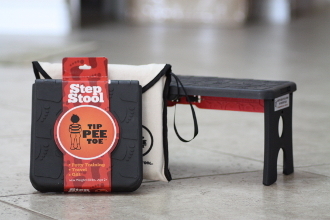 If you are looking for a unique gift for friends or grandparent, or just a children's product to make parenting or potty training easier, the Tip Pee Toe™ toddler step stool is for you. It is light weight, compact, holds up to 50 pounds, stands 5.5 inches high when opened, and has non-skid feet. This step stool makes a great portable footrest or footstool as well. Note: This listing includes a canvas carrying case with velcro closure and wristlet. Carrying case is natural color with black trim and black wristlet and fits one Tip Pee Toe™ child's step stool in the folded position. Warning: The Tip Pee Toe™ child step stool is designed to use with adult supervision only. Do not leave child unattended on the step stool and assist child at all times to prevent fall. Manufacturer: Tip Pee Toe, Inc. Copyright © 2011-2019 Tip Pee Toe, Inc. All rights reserved.